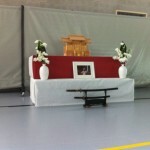 Tuesday the 29th of July 2014, at the 8th EKTG Summer Camp, a memorial for Shihan Alain Breugelmans, who passed away the 5th of May 2014, was held. 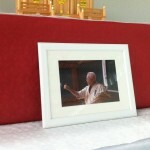 Here follow the speech made by Kaichô Toru Tezuka on this occasion, translated in English by Shihan Ito. I am mourning Shihan Alain’s death more than anybody else. For me he was the existance like a younger brother to be loved. His mail always start with ”Ani-san” (older brother). In the year 2004, I met him first time. Shihan Alain came to Quebec, Canada to join Shihan Sjaak. He was probably bit nervous to meet Japanese Karate-ka, because of his previous experience with other Japanese Karate men. I was staying Shihan Michel’s home in Canada. We meet at Shihan Michel’ home everyday. I cook for them , and ate together everyday. Everytime when I visit Canada, I do. It was almost a rule. Later Shihan Alain told me that he was calling home every night, had told his wife about meal which Kaicho Tezuka cooked everyday and ate together. In old Japanese tradition, eating from a same rice cooker meant that the person/people became a member of the team, and getting understand better each other. I heard his wife told him to stay and work with such a person. Anyway it was the first encounter for Shihan Alain and me. Later Shihan Michel and I visited Holland, Shihan Sjaak joined with us. However sometime after, Shihan Sjaak’s activity did not meet our group standard, he was resighned. I thought Shihan Alain followed him, but he wished to stay with Tezuka group. I respected his thought, depend on his action and decision. Even he visited me in Japan many time. Then we expand our activity to Russia, Pakistan, Kazakhstan, Azerbaijan, Puerto Rico, Boston (US), Canada, and all over in Europe, then I visited those countries with Shihan Alain. It was my favourable memory with him, but now it also brings me sadness. During those activities, I became very serious ill. But the existance of Shihan Alain was my hope and peace. Sometime I think what makes us happy or unhappy for us as human beings. Then it reflects on Shihan Alain, was he happy with activity in this group? He put might, mind and all his effort till burning him out. Appreciation, that is the only word come out from my mouth. It was so greatful in each moment, from the first meeting with him to his farewell. I will work hard with all members in Tezuka group to finish things which he left undone. In the sametime I am looking forward to seeing him in some day. He is still living in everybody’s heart and mind, and his spirit watch over us. Thank you my be loved brother, Alain Breugelmans. Here follow the original japanese version of the speech made by Kaichô Toru Tezuka on this occasion.